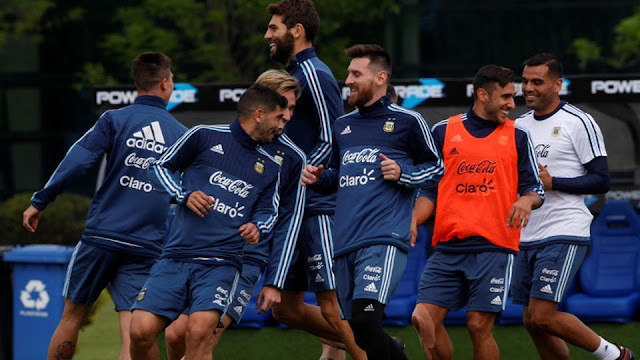 Argentina football team during a training session on Wednesday, ahead of their 2018 FIFA World Cup qualifying match against Peru. FIFA president Gianni Infantino asked Argentina football team to “do more” for the game aside from producing star players like Lionel Messi on Wednesday, as the country announced a joint bid for the 2030 World Cup with Paraguay and Uruguay. “The Argentine Football Association can do a lot for football and not just with the players on the pitch, with Messi and all his teammates,” Infantino said after a meeting with the presidents of the three South American countries who announced their bid for the centenary World Cup. “Argentina has had a bad time in recent years, at an administrative level, like others in the continent and outside the continent, like FIFA,” the Italian added, in reference to the corruption scandal that shook the football world in 2015. Three former presidents of South American football’s governing body CONMEBOL were detained or put under house arrest in the wake of the scandal, as well as several national federation bosses. The new CONMEBOL administration, in place since January 2016, has had its reforms hailed by audit firms and FIFA.